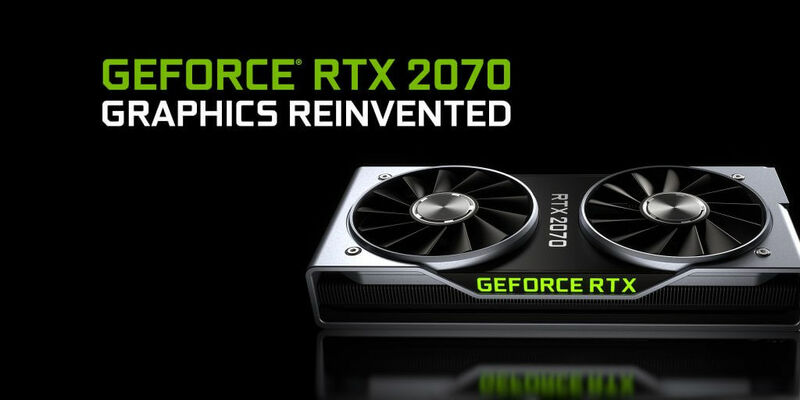 The Nvidia GeForce RTX 2080 and 2080 Ti are the flagship high-end GPUs that are really expensive, but the Nvidia GeForce RTX 2070 is a much affordable and mid-range graphics card that delivers a promising efficiency and performance to the users. We have already spent a couple of months in 2019, and there have been exceptional changes and improvements in the gaming industry in front of our eyes this year. Since 2017, game developers were working really hard to produce games which will intrigue the gamers by higher standards. That was possible only by making the games more realistic, exciting and visually appealing. But to support such games, you will need a good PC with the right system configuration. The most important element which helps you to play high-end games is the Graphics card. So today, we are going to talk about such a GPU which is Nvidia’s latest launch. Yes, we are talking about the Nvidia GeForce RTX 2070. The Nvidia GeForce RTX 2070 is manufactured to provide a more affordable solution to high-end gaming, as the RTX 2080 and 2080 Ti are exceptionally expensive GPUs. The RTX 2070 brings to the gamers most of the new technology that was seen in the high-end GPUs as well, but you should not expect the same level of performance. In this guide, we will give the Nvidia GeForce RTX 2070 8GB Review in details to help you determine whether it is the GPU you need or not. The Nvidia GeForce RTX 2070 8GB is a mid-range GPU which offers you the latest technology of the newest generation of Nvidia graphics cards. If you want to experience a Quad HD gaming time and enjoy the future of gaming visuals, but cannot stretch to the likes of RTX 2080 Ti, then the RTX 2070 can turn out to be the best option. The Nvidia GeForce RTX 2070 comes to us as a high-level contender in the mid-range GPU segment. Its nearest competitor AMD RX 590 and the 580 can support most of the games of our time, but the RTX surely got an edge over them as we tested them on various games. Real-time ray tracing technology and DLSS support in this GPU will surely help you to enjoy exuberant in-game graphics and realistic details in every frame. Let us check the Nvidia GeForce RTX 2070 8GB Review and learn more about it. Just like most of the previous Nvidia models, Nvidia GeForce RTX 2070 is exceptionally higher in price than its predecessors but significantly lower than the flagship GPU. The Nvidia GeForce RTX 2070 is available to you at a price of $599 or £569. Many of you would be wondering why we termed the RTX 2070 a “mid-range” GPU. Well, in that case, you should know that the RTX 2080 Ti starts from $999 and extends up to a price of $1400. 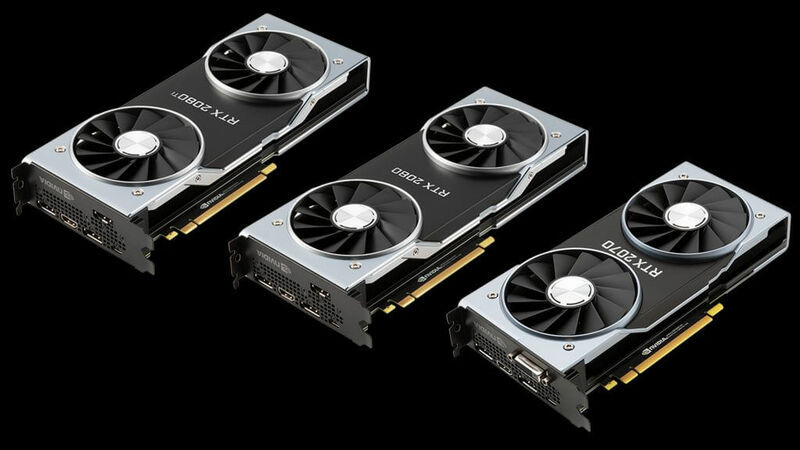 Thankfully, the third-party GPU vendors have introduced a more convincing price of $459-$499. Other competitors in the market like AMD have their closest equivalent at $499 for the Radeon RX 64. Nvidia GeForce RTX 2070 is looking sophisticated enough to get the modern makeover. It is 28.01 cms in length which is just a bit shorter than the RTX 2080. However, when it comes to height, both the GPUs have the same dimensions. They have roughly 4.4 inches or 11.3 cms of height, starting from the end of the PCIe Slot till the head. The RTX 2070 is approximately 4.11 cms wide and can sit easily inside your cabinet. The RTX 2070 comes with a dual fan setup with four heat pipes made out of copper and also a direct-touch heatsink. The GPU gets a completely black color finish that looks aggressive and ready to support your gaming needs. There are 3-full-sized DisplayPort, 1.4 connectors, along with one HDMI 2.0 port, and VirtualLink support via a USB Type-C port. Thus, connectivity will not be a problem. Nvidia has also integrated a white LED notification light that notifies you in case there is any problem with the auxiliary power. In terms of technology, Nvidia GeForce RTX 2070 gives a stiff competition to the GPUs of not only other vendors but Nvidia’s own GPU lineup. It has 2304 CUDA cores that are significantly higher than the RTX 1070 which has 1924 CUDA cores. These cores have been dedicated to providing maximum power and efficiency to the GPU while playing games. Nvidia’s TURING architecture helps the GPU to get 6-times more powerful performance than the previous generation Nvidia Graphics Cards. It also helps the GPU to bring a new range of AI enabled features along with Real-time Ray Tracing Technology. The RTX 2070 is integrated with the next-gen 6-phase power supply. It helps to overclock the GPU to its maximum capability. Ray Tracing Technology helps to harness brilliant lighting and particle details which give any game a hyper-realistic makeover and remarkable gaming experience. This GPU helps to add more depth of field and accurate color balance into the games to make them more vibrant. Several in-game elements and environment turns more phenomenal due to the Ray Tracing Technology, even though you will not be able to see the difference almost immediately, they will be applied in a subtle manner. Coming to the performance of the Nvidia GeForce RTX 2070 8GB, there are some unique features to be noted. 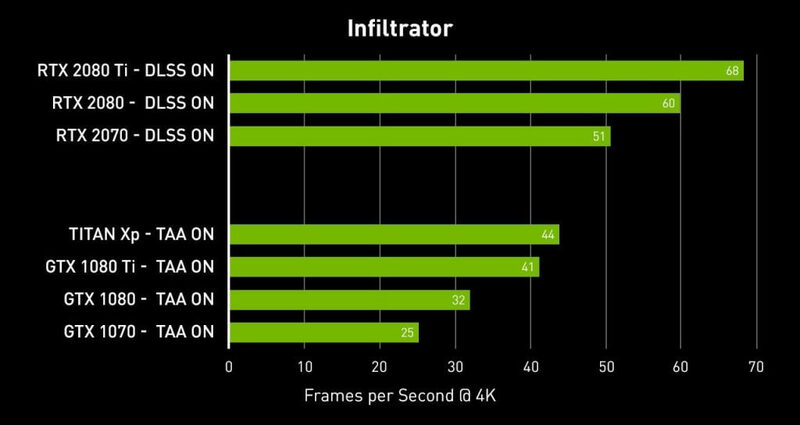 We tested a host of different PC games to understand the performance levels of the GPU including Atomic Heart, Battlefield 5, Ghost Recon Wildlands, MechWarrior 5: Mercenaries, Metro Exodus and the Shadow of the Tomb Raider. The 8GB DDR6 RAM along with 14GPBS memory speed provides the system with a seamless and quality CPU performance. The 2304 CUDA cores surely helped the GPU to get an edge over most of its competitors. The benchmark scores of the Nvidia GeForce RTX 2070 8 GB came out to be really well. In our benchmark tests, Nvidia GeForce RTX 2070 8GB turned out to be a real game-changer in both Quad HD and Full HD games. However, if you are planning for 4K resolution, then you need to expect average performance. And, if you want to play games post-2017, then we can assure you that you will get a satisfactory outcome of the GPU. When you run any game in 4K resolution, it turns out that it isn’t very much capable of running the game seamlessly and occasional frame drops and stutters were visible. But things turn to the positive side in Nvidia GeForce RTX 2070 8GB as soon as you use Quad HD or Full HD settings which can run the game easily between 71FPS-83FPS. You’ll be surprised that the graphics are excellently managed and there is a hefty balance in all the aspects of the game. Most of the challenging games like the Shadow of the Tomb Raider, Ghost Recon Wildlands or Assassin’s Creed Odyssey ran smoothly in Quad and Full HD graphics. When compared to its rival AMD Radeon Vega 56, the RTX 2070 did a much better job with almost 15-20% better performance results in most of the games. Battlefield 5 was the only game that supports true Real-time Ray Tracing, and the RTX 2070 did a decent job to trace most of the rays and reflection. We experienced a brilliant change with the RTX Tracing feature on, and we are sure you will be interested in keeping it on. There was no noticeable frame drops or stutter that interfere with the game. Battlefield 5 will run smooth and fine with RTX 2070. Nvidia GeForce RTX 2070 8GB is a true gaming GPU that will surely help you to enjoy the thrills of any game. The excellent technologies which have been featured in this GPU support latest gaming and graphics like never before and more importantly it will help you get a mind-blowing Quad and Full HD gaming experience. Considering the price it is available in the market, many people would wonder how it is a mid-range device, but it delivers astounding performance undoubtedly. It will be a true $499 investment that will keep you satisfied for a long time. 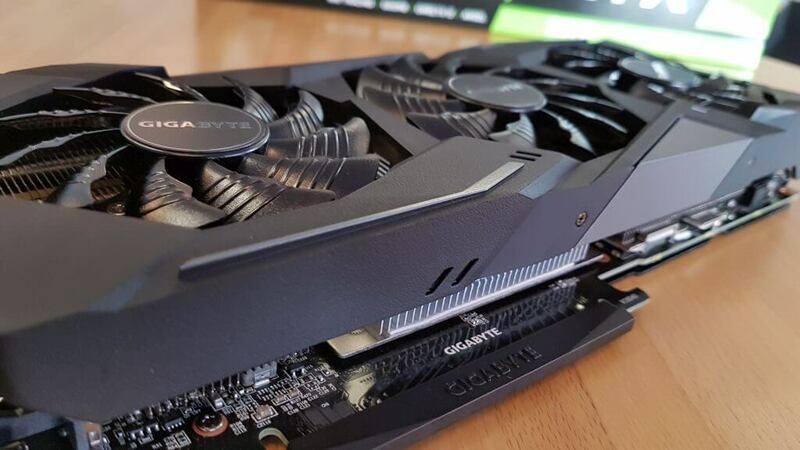 Best Graphics Card for Gaming 2019 Which You Should Opt For!